May 2005, Volume 2 Issue 5 Know It - Profit! Exchange traded funds, or ETFs, are a great way to target specific stock market sectors. Built like an index, they are traded just like a stock. This month, we'll look at which ETFs are out-performing the S&P 500. But first... how are the US markets holding-up against other markets world-wide? The answer may surprise you. This month, there are at least 29 other world markets fairing better! 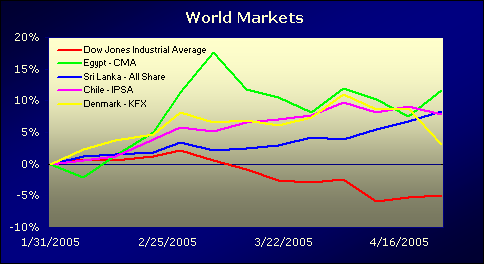 Here are this month's top four world exchange indices compared to the Dow Jones Industrial Average using the relative strength comparison method. The Egyptian Stock Exchange CASE 30 index is up over 11 percent for the last quarter. The Sri Lankan, Chilean and Danish indices are up solidly, as well. The Dow is trailing the top performer by almost 17 percent! Use caution here... the Dow is a leading world indicator. These indices may be in for a sharp sell-off. Some are already trending lower. Being able to trade an index like a stock is a dream come true. Exchange traded funds (ETFs) do just that. Covering a wide variety of sectors, traders can easily diversify their portfolios without committing to the volatility of a few select stocks. The Biotech, Pharmaceutical and Utilities HOLDRs are keeping their heads above water. The Energy Select SPDR appears to be in a gentle slide. Although the four ETFs are relatively strong, they are nearing the end of their recent moves up. For example, if you have Utilties HOLDRs Trust (UTH) in your portfolio, you may want to take the following into consideration. UTH is in a mature bull run which began in October 2002. 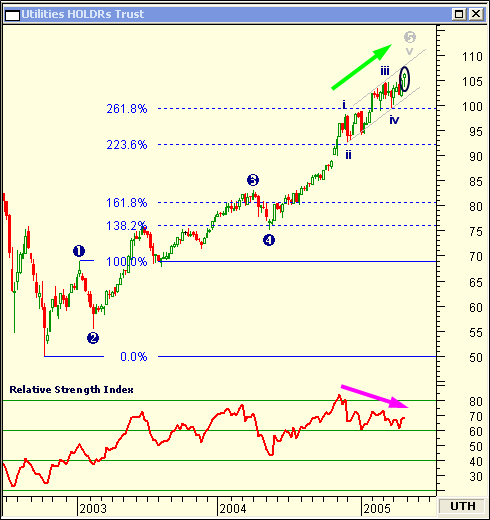 The Elliott Wave count is showing a final mid-term fifth wave completing in a longer-term fifth wave. If you apply the channel forecasting method, the mid-term price target is just a few weeks away. Also... the coinciding fifth wave terminations don't bode well for UTH! Next, UTH has reached significant Fibonacci price targets. In Michael Jardine's book, New Frontiers in Fibonacci Trading, he uses Fibonacci extensions to forecast price objectives. Measuring from the first wave, he says the third wave will typically terminate between the 138.2 and 161.8 percent extension zone. The fifth wave will usually reach the 223.6 to 261.8 percent extension zone. Based on Jardine's Fibonacci zones, UTH is over-extended and ripe for a correction. Additionally, the relative strength index is diverging from price... forecasting an impending reversal. Finally, the hanging man candlestick pattern marks resistance and the probable end to the up-trend. In the March 2005 issue of Chart Wealth, I called for Kerr-Mc-Gee Corp (KMG) (View Chart) to continue its bullish rise. The following week, KMG hit a third wave high of $83.30 and has since stalled. The relative strength index is still above 60... showing no signs of weakening. As long as oil prices continue to climb, KMG should find support and trend higher. Also, I called for the Dow Jones Industrial Average (^DJI) (View Chart) to correct down from its double top if price broke below 10,300. On 4/14/2005, the Dow plunged through the 10,300 level confirming the double top. Although the 9,700 level hasn't been reached, it is definitely in range! In order to see the "big picture," you need to look beyond the US markets. And... if you're interested in a particular foreign index, there may be an exchange traded fund (ETF) to match it. 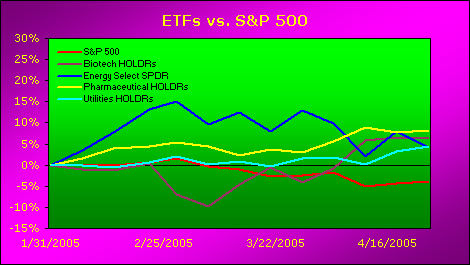 Remember, use ETFs to trade an entire sector... eliminating the need to trade a handful of stocks.